The recently published Annual Report highlights the RCSB PDB's accomplishments for 2011. Milestones covered include the ways in which searching has been simplified. Complex queries can be made by simply clicking through the distribution charts provided for major data categories. The top bar of every web page also offers easy and intuitive searching. After typing a few characters, an interactive pop-up box appears with suggestions of common PDB search terms, organized in different categories to provide more precise results. 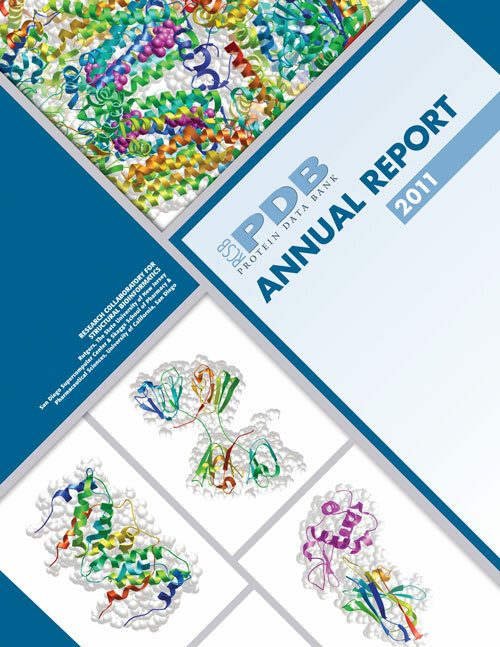 The Annual Report demonstrates the features of the new PDB-101 educational resource. This view of the RCSB PDB website packages together resources of interest to teachers, students, and the general public to promote exploration in the world of proteins and nucleic acids. To promote top-down exploration of the archive, PDB-101 offers an interface that lets readers browse from high-level functional biological categories down to spe cially selected related molecules. wwPDB efforts, such as the PDB40 anniversary celebration and the publication of the X-ray Validation Task Force's recommendation report, are also highlighted. These bulletins provide a yearly snapshot of RCSB PDB activities and the state of the PDB archive. This edition, the RCSB PDB's twelfth, is available as a PDF download from www.rcsb.org/ar11. If you would like a printed copy, please send yourpostal address to info@rcsb.org.